Journals and magazines are among the most obvious forms of the media. In the world of media, no other organ is richer in subjects or cheaper in costs than the magazine. It is for this reason that we can see hundreds of magazines on the shelves, magazines aimed at young people, magazines about politics, literature, science, the economy, astronomy, design, fashion, music, and so much more. Magazines have the dynamic nature of a television channel with the influence of the press. The Islamic media has taken advantage of this great opportunity for expression for many years, but the energy of Islamic magazines and journals has visibly increased over recent years. These - national or international - publications fill an important gap in the area of communication and allow for nearly every group in Islamic societies to find a niche for themselves. 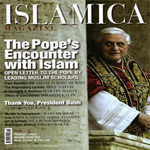 Islamica Magazine is a quarterly journal produced in English and distributed worldwide; in general it runs to about 128 pages. It has a modern design, and is a glossy color magazine published by the Center for Inter-Civilizational Dialogue Inc., a non-profit organization based in the United States. Although the majority of its readership is in North America, it has a significant number of readers in both the UK and Europe. Islamica is widely distributed in over 20 different countries around the world. Islamica magazine aims mainly to broaden perspectives on Islam and to give Muslims the opportunity to voice their concerns. Islamica also enables the establishment of cross-cultural relations between Muslims and their neighbors and co-religionists. The magazine covers the following topics: Religion, Family, Sufism, Law, Politics, History, Philosophy, Economics, Sociology, Anthropology, Psychology, Psychiatry, Health, Education, Current Affairs, Culture, Science & Technology, Media, Literature, Poetry, Fiction, Art & Architecture. Islamica draws from a broad cross-section of leading scholars, thinkers, writers, activists, academics, journalists and experts from around the world in an effort to present various perspectives on events, as well as discussing issues, ideas and opinions on Islam and the Muslim world. Islamica, the winner of the 2008 Derose Hinkhouse Awards and the finalist in the 2007 Utne Independent Press Awards, seeks to fill the gap that exists in forums and thus enable Muslims "to communicate their ideas within the broader cultural and political discourse", to reach and draw a larger audience both inside and outside the Muslim community. Focusing on the most pressing issues of our time, Islamica invites one and all to become a part of this dynamic process by participating in the public discussions and current debates on the magazine and website. 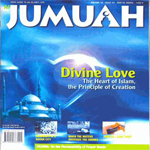 Al Jumuah is an Islamic magazine that is published monthly by Al-Muntada Al Islami, Inc., in the United States. The main aim of the magazine is to be a guide for all individuals worldwide who are trying to lead an Islamic life. In the magazine, the reader can find noteworthy matters such as the Muslim Creed, Islamic jurisprudence and Islamic education. Questions on these subjects are answered with articles that use the Qur'an and the Sunnah as their main sources. The readers of the magazine include, dawa workers, doctors, engineers, students and inmates. 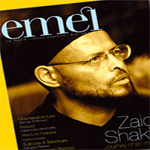 Emel is a monthly and glossy British lifestyle magazine that celebrates contemporary British Muslim culture. The magazine title derives from the letters "M" and "L" standing for " Muslim life" and also resembles the Arabic word for aspiration, amal. The magazine was launched in 2003 by a Muslim convert, Sarah Joseph, who is also the current editor. She became a Muslim when she turned seventeen. "I discovered prejudices in myself that I want to deal with "she says. At 19, she gave her first public presentation on Islam, and for the past twelve years, she has become a leading voice among the British Muslims. Emel covers multiple aspects of life including health, fashion, education, parenting, relationship, finance and environment. There is also a lifestyle section on the interiors, food, gardening, clothes as well as articles on sports. Emel comprises of full 100 pages in colour. It had previously been available in specialist Muslim bookshops and relied mainly on the word of mouth to attract new readers and subscribes. It has since become the most widely read British Muslim magazine in the UK to also non-Muslim readership and its circulation now covers 30 countries. It has a print run of 20.000 to 30.000 subscribers. "We need to make Emel available to more people" says Joseph. "There is no point in having a great product if people don't get to see it. Once we stabilize here in Britain, we hope to be able to expand to the other markets that want us." And that is the great hope of Emel.